Each year Americans lose billions of dollars to fraudulent activity. 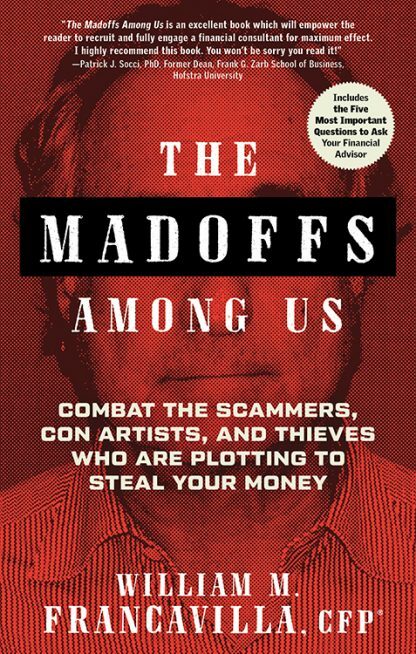 The Madoffs Among Us shows you in graphic detail why and how people fall prey. Most important, it shows you how to easily identify the people who perpetrate these crimes and avoid their deceitful practices. Why do smart people fall for these cons? What are today�s most common scams? And how can you avoid becoming a victim? Many people abdicate their responsibility to participate in the investment process because they just don�t know much about financial planning, and they rely upon an advisor. The Madoffs Among Us arms you with tangible and simple actions to protect your wealth, no matter its size. From the very first chapter, you will appreciate why good advisors are worth their weight in gold and bad advisors could cost you a fortune. With uncertainty surrounding the potential repeal of some of the most important protections of the Dodd-Frank Act this book will become even more important. The real-life examples of fraud are numerous and alarming, but The Madoffs Among Us gives you the concrete measures you can take to minimize the possibility of being ripped off. William M. Francavilla is a Certified Financial Planner� with more than 30 years of experience in the financial services industry. He has worked as an investment advisor and professional trainer for several Fortune 500 companies, and retired from Legg Mason as senior vice president and director of corporate wealth management. Francavilla presently is a consultant to some of the most successful financial advisors and financial firms in the country. He speaks and writes to help clients and advisors better understand how best to succeed. His book is highly acclaimed by leaders in the financial industry.